Did you know that you don’t need council approval to build a granny flat on your property? This means that you can have a 2 bedroom granny flat built in your backyard, with no council approval, without neighbours objecting and approved in as little as 10 days. In 2009, the NSW Government released the Affordable Housing State Environment Planning Policy (SEPP) which permits all residential home-owners with a property larger then 450m2 (which also has a minimum 12m street frontage) to build a granny flat on their property. 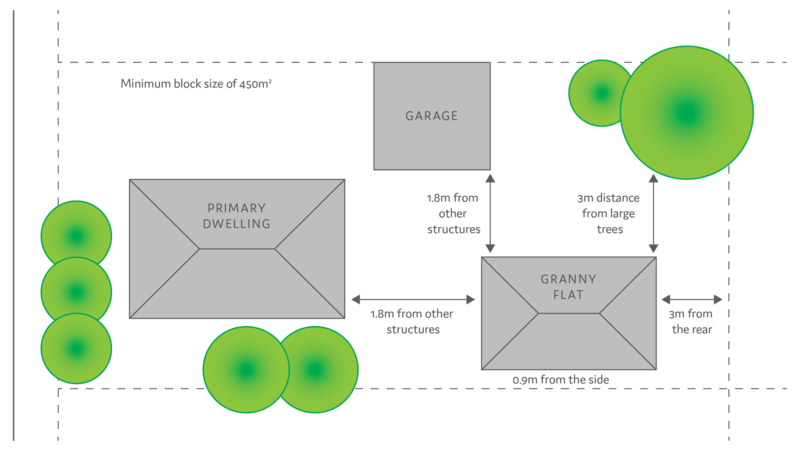 The NSW Affordable Housing State Environmental Planning Policy (SEPP) was introduced in 2009 allowing granny flats in NSW to be approved as a complying development in just 10 days. This legislation means that residential home owners do not require granny flat approvals on their property subject to some minimum requirements. Property must have a 12 metre width at the building line of the existing dwelling. If your property does not meet this requirement you could apply for an attached granny flat. The diagram below shows the requirements for a block that is between 450sqm & 900sqm in size. The requirements change for properties which are larger than 900sqm. Refer to Supporting secondary dwellings (granny flats) fact sheet for further details of large site requirements.